Another ‘wrapping up’ trip, this one finishing off Northern Ireland passenger track and extending down to my only bit of passenger track in the Republic, so keeping my red lines joined up! I’ve included it in my memoirs on the basis that the Republic of Ireland is a perfectly good EU country! Odd to be starting a new book in the UK. 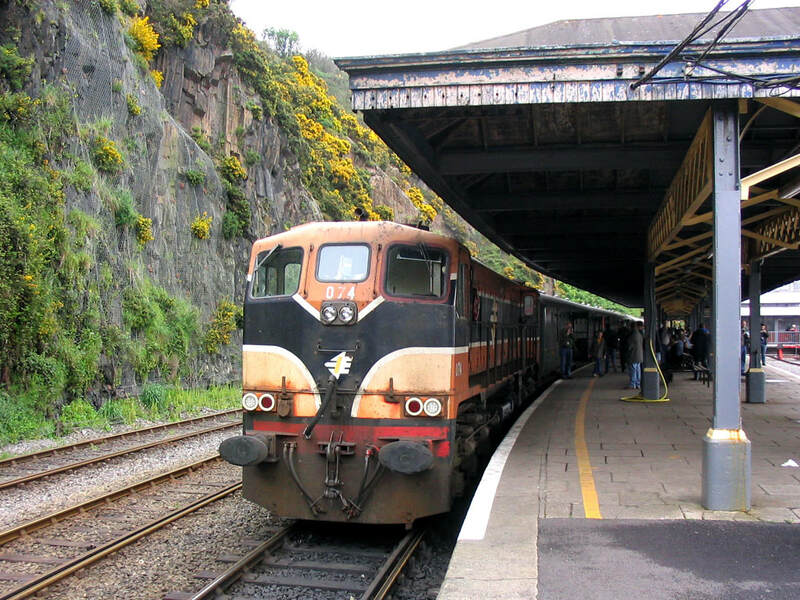 The venture being a MRSI tour from Belfast to Rosslare and Limerick Junction, a useful opportunity to clear Northern Ireland as it is at present, and have a look over the border for the first time since 1965. The trip commenced at Telford Central as usual, with an ATW 158 which was 6 late, then 9, then 12… turned up about 15 late in the end which so confused the station staff that after it (and I) had gone, they told H that it was just arriving (in fact it was the following Wellington-Walsall!). No air-con, no seats on ATW so I baled out at Wolves and retired to the Great Western for a very fine pint of Golden Glow. This defiance of ‘Dave’s Always Get As Far As You Can’ rule very nearly cost me. The plan was to get the 1241 VXC to Irrational, due at 1315 for my 1410 flight (I’d already checked in on line). On arrival at about 1234, a CT 170 was just leaving for BNS, and the VXC was showing 30 late. Mercifully there was a 1237 CT as well, which was a Desiro and more or less on time. Off to BNS, delayed en route but arriving BNS at 1257 just in time for the 1300 Bendyleano. That’ll learn me. After threats of a 15 minute delay the BA Embraer left a couple of minutes late and arrived early at Belfast City, a truly scary airport. But for the absence of free G&Ts on cheapskate BA Connect, and the venomous smells emanating from a nearby seat, it would have been a pleasant flight. I couldn’t, for the life of me, find the way to Sydenham station. Turned out in the end if you ask a security bod they radio for a bus which takes you to the station footbridge. The reverse is achieved by phoning from a little bothy at the end of the bridge. Weird, but it works. If you understand it of course. Heaven help foreigners. Anyway, with Sunday’s exit strategy established, I caught the bus to town. £3.50 for a day rover if bought after 1500 (it was). A slow but educational journey. Onwards to my B&B, which was just horribly awful. Never again. Thence to the Vineyard, a very fine offie in the Ormeau Road which purveyed me two bottles of Strangford Lough Legbiter (honestly) and one of a wheat beer from the Carlow Brewery. Price was insane but it must be said they had a very fine selection of continental beers. Next stop was the Crown in Great Victoria Street, possibly an Arriva pub as it had no seats and no air conditioning. Nice pint of Whitewater Belfast Ale though, marred only by the price (£2.85 – silly). I then retired round the corner to a ‘Spoons which was semi-dark, also heaving and fantastically noisy. But it did have seats and a pleasant enough dark beer, somewhere ‘twixt mild and stout, for a far more reasonable £1.60-ish. I managed to forget the name, memorably stupid though I’d thought it was! Meanwhile, having finished my pint I departed to the gents’ to find a vigorous discussion going on. With the arrival of another participant this developed into a fight. I thought it prudent to retire and advise the nearest member of staff; she disappeared rapidly and within seconds the bouncers tore up the stairs and into the gents’, all guns blazing (metaphorically of course). I made my way outside and while pausing to put my jacket on, the bouncers reappeared with the ‘late arrival’. All impressively efficient and no casualties as far as I know. Deciding that the city centre wasn’t the place to be, you reporter retired by bus to the Botanic Inn (not that the bus went there, but I’d realised in time and dived out only about 200 metres away). Large factory type pub, not very inspiring but plenty of seats and the Whitewater Ale was OK and substantially cheaper than the Crown. Back to the B&B via the ‘convenience store’ for some emergency provisions for the railtour, and so to bed after watching some of ‘Timewatch’ about the 1906 San Francisco earthquake. Up betimes, taking some delight in waking up noisy neighbours at 0530! Walked up to Central to make sure of getting a decent seat on the tour train which proved a very wise decision as all decent seats had gone by the time we left. The 111 (actually 113) duly appeared with nicely turned out Mark IIs in RPSI markings. First track of the day was the City Junction – Central Junction ‘curve’ (actually main line, it’s City Junction – Gt Victoria Street that’s new). 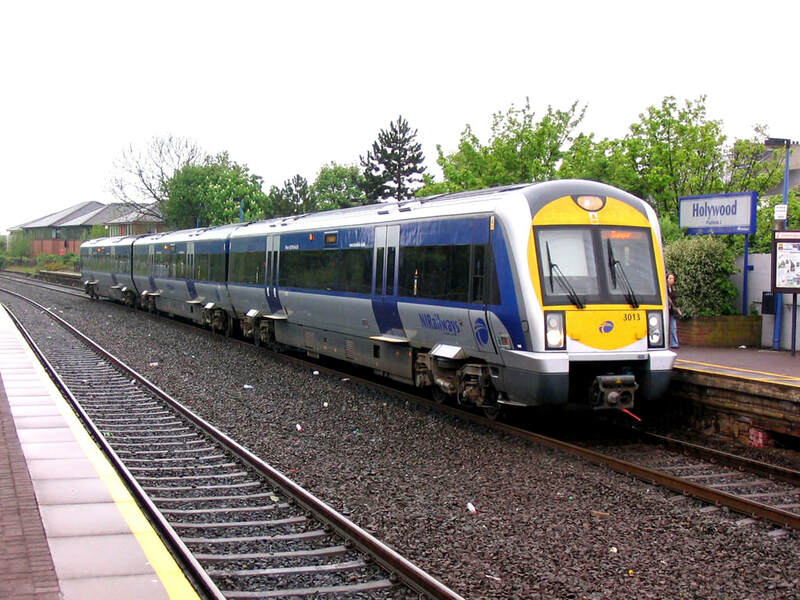 Then new track from Lisburn onwards, a fine turn of speed being shown by 113 in places. 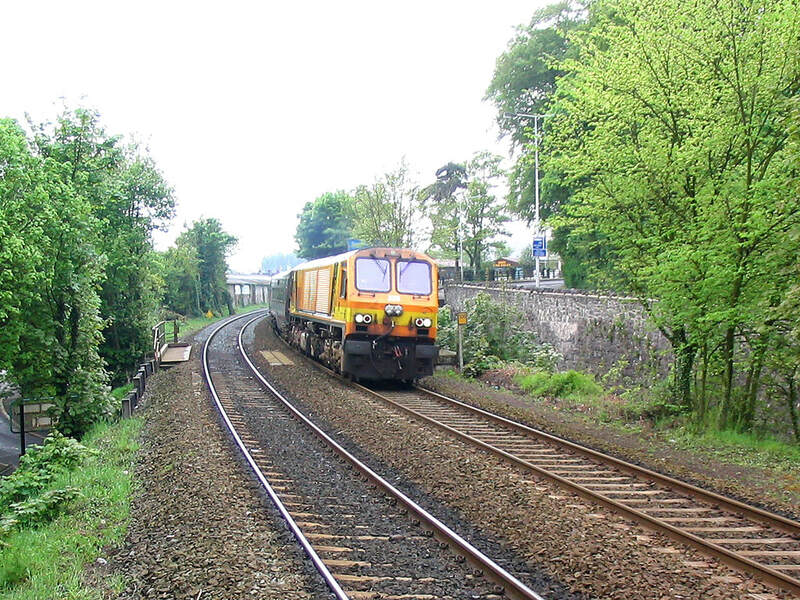 A lengthy stop was made at Drogheda for the 0650 Belfast – Dublin Enterprise to pass. 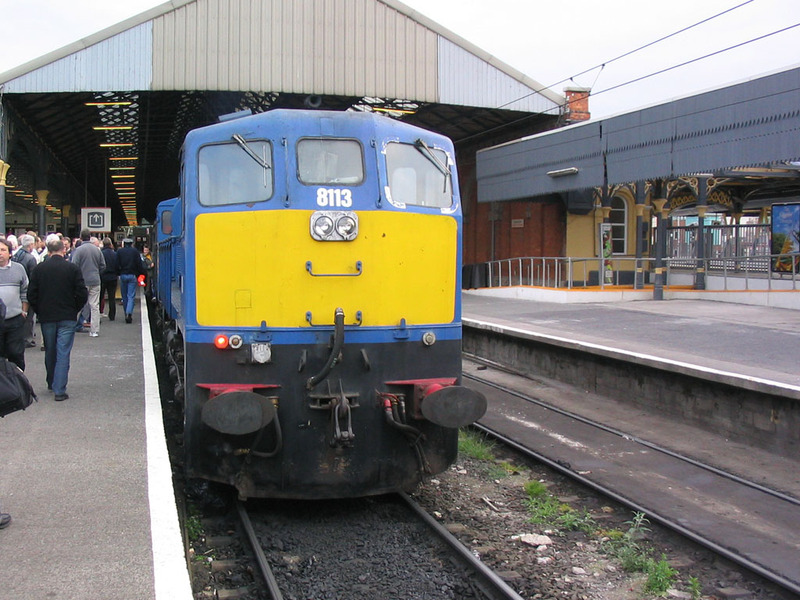 Surprise ensued at Dublin Connolly when 113 was removed. This seemed to surprise the organisers as much as anybody. IR 080 was the replacement. Leaving 5 minutes or so late we’d virtually regained the time at Bray but then had to wait for a DART train to do the single line to Greystones and back. Nearing Wexford currently, we’re still 12 late. ‘Near street’ running leaving Wexford along the quay (it used to be street running, but is now reserved). The Waterford line looked very rusty at Rosslare Strand. We were turfed out at Rosslare Harbour/europort while the train set back to run round in the loop west of the station. But hey, I did the pier in 1965! On then to Waterford with a photo stop at Wellington Bridge, famed for beet loading. It’s not an outstanding run though there’s a very fine 13 span (one swings) viaduct over the rover Barrow between Cos. Wexford and Waterford. 50 minutes remained of the 1 hour beer break at Waterford so I made haste to McLaughlin’s in O’Connell Street for a pint of Smithwick’s. Keg obviously, but bearable under the circs. €3.80 (about £2.30) the pint. On return to the station the train had moved from east to west end of the one through platform, and the loco (080) had been replaced by 074. 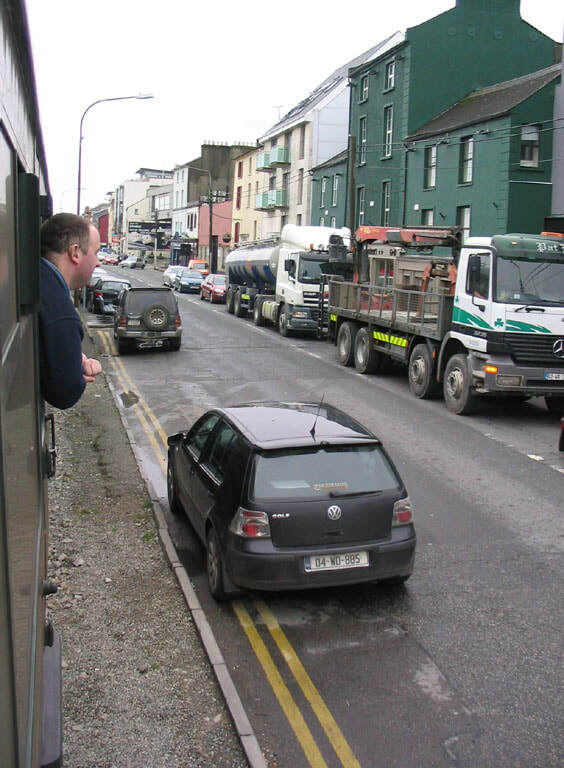 A phot stop was held at Carrick-on-Suir for the ITG’s assortment of aged diesels, before going on via Tipperary (it is) to Limerick Junction. The move there was stop just beyond Keane’s Points (but before the junction with the curve from the Dublin line) and reverse back into the through platform before setting off back to Dublin, 10 late. A good thrash up the Cork – Dublin line gained some time, only to have it thrown away by an extended stop at Kildare. However with 45 minutes for 35 miles all is not lost! And it wasn’t – in to Connolly 7 minutes early at 1938 and better yet, into the terminal platforms on the east side. 113 was reattached at Connolly and left 22 minutes early. We seemed to be following a DART local as far as Howth Jn but thereafter 113 got to work and as I’m writing this we’ve just left Portadown 26½ early. More surprises at Waterford. While I was across the river having a look round, 080 turned into 074... The train is standing at the west end of Waterford's one through platform. Very much a snapshot as I couldn't lean out! The tour train is heading south along the quayside after departing from Wexford. I understand this used to be street running, but as can be seen from this picture it's now segregated. 113 on the tour train on the through lines at Dublin Connolly. The NIR loco was removed here, to everybody's surprise, and IE's 080 took over. 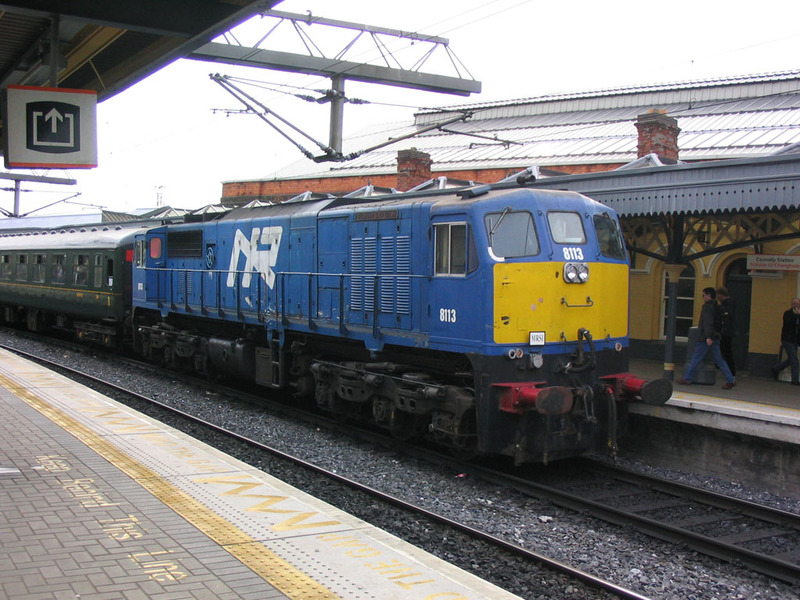 074 returned us to Dublin Connolly via Keane's Points (reverse) and Limerick Junction (reverse). Conveniently for us trackbashers it ended up in the terminal platforms at Connolly, where 113 was reattached for the run back to Dublin. Not quite so betimes this morning (0740) and pleasantly surprised by a very efficient shower delivering plenty of hot water. Breakfast OK though sliced packet ham instead of bacon was a surprise (as was potato bread if I’m honest). The gricing day started with a timewaster – out to Lisburn and back on one of the fancy new CAF karts. Very much in the Desiro mould but loads of noise and vibration from underfloor engines. 6/10 at best, and only because the 80s were so dreadful. A brief wander to the market ‘square’ in Lisburn – I took quite a liking to the place, though maybe that’s because it’s not Belfast! Back in Belfast I trotted off to the Revelations Internet Caff, which was a bit late opening but I was able to check in for this afternoon’s flight which was exceptionally useful, and a quid well spent. Though I’ve got stuck with 18A and on a turboprop too! That sorted I made my way out to Hilden on another kart. I managed to grab a photo of the 201 on 1201 from (Dublin) – Lisburn – Belfast Central before pottering off to the Hilden Brewery tap. What a splendid establishment, with two of the pleasant-est staff you could hope to meet. Samples were offered of Hilden Ale, Silver (a lager-pilsener sort of thing) and Molly’s Chocolate Stout, seemingly to be produced at the new College Green microbrewery, starting in a few weeks. Predictably I didn’t like the stout – the usual burnt crystal malt taste! Hilden Ale tasted stronger than it was, luckily, but the Silver I thought really excellent. A pint each of Hilden Ale and Silver and a very nice chat [about matters Irish in general] which was just getting interesting when I had to hurtle off for the 1327 to Belfast! Which I caught by a fairly narrow margin. This took me through to Great Victoria Street where a phot stop was taken (Crown, Robinson’s) before the 1410 Derry for my very last bit of NI track (Bleach Green Jn – Antrim). Duly done with no problems and I decanted at Ballymena to await (in Wetherspoon’s) a Derry – Belfast kart. ‘Spoons was offering Charles Wells Eagle at £1.29 which even at that was overpriced and I left some, possibly a first! Irish stew on the other hand was excellent and saved me from having to go to McDs, seemingly the only other place to eat! Back to the station in good time for 1627 to Belfast, even if it hadn’t been 12 late. This doesn’t seem to be a problem however, as there’s half an hour in Belfast. It wasn’t (a problem). Plenty of time before the 1747 from GVS to Bangor, another CAF cart which was a minute or two late. This was taken to Holywood, thence on foot the very short distance to the Dirty Duck Ale House. To my surprise, this was wedged – a number of irritating people who I took to be sailors (of the recreational sort) but mostly pleasant normal people! Beers were from Inveralmond of Perth – Thrappledouser, Lia Fail and Independence (which I sampled, it being the weakest). Back to the station for 1919 to Sydenham which to my relief was on time (the taxi office across the road from the station helped my peace of mind). The footbridge/phone/courtesy bus system worked very well, with the bus arriving almost instantaneously (he did have an incoming passenger). Flybe turned up on time; the Bombardier Q400 Dash 8 seemed very civilised for a turboprop, and we were early at BHX which had its usual share of administrative failures. Despite all this, from a booked 2130 arrival I was on the platform at Irrational at 2135 in time to smell the diesel exhaust from the 2134 and see the signal go back to amber behind it. Still, after all my gripes I can’t fault VXC for being on time. CT were likewise, with the 2148 Desiro to New Street, and ATW got me back to Telford. The 1201 Enterprise departure from Lisburn was hauled by IE's 228, seen here approaching Hilden. 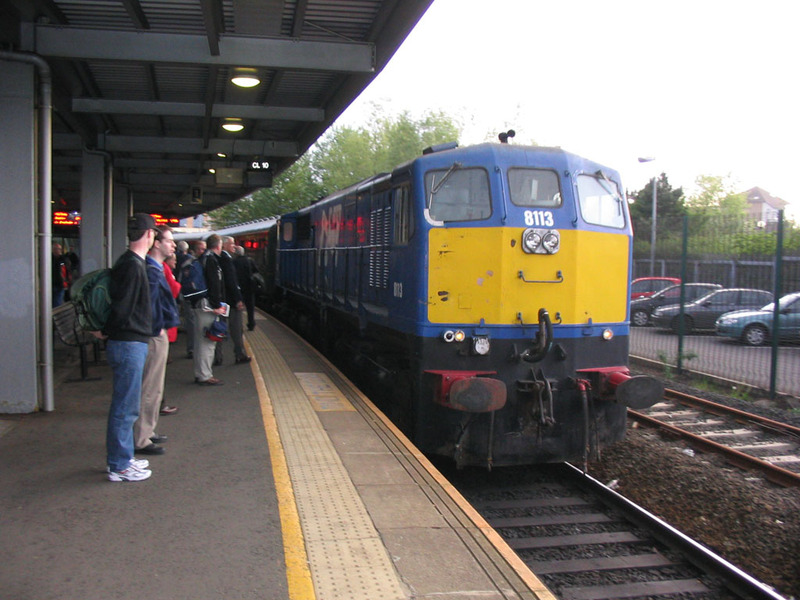 NIR's CAF-built unit 3013 is seen here at Holywood on a Portadown-Bangor service. With the Berlin engineering works finished there was more to do there, so I set off again to Germany for another weekend bash in July.